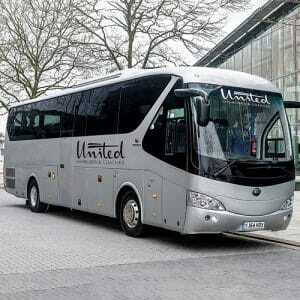 Looking For Coach And Minibus Hire in Crawley? If you’re searching for quality and reliable coach hire in Crawley, you’ve come to the right place. Whether you’re visiting the local area as a group, attending a social event or planning wedding guest transportation, United Minibuses and Coaches is proud to be one of the top coach companies Crawleyhas to offer. Why Choose Our Crawley Coaches? 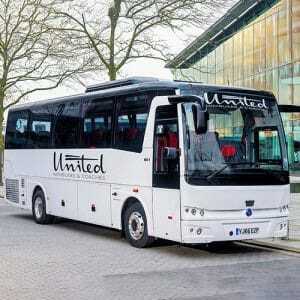 When you’re looking for Crawley luxury coachesto transport your group to your destination, you need look no further than United Minibuses and Coaches. We have an impressive fleet of stylish, modern vehicles that stand head and shoulders above our competition. With everything you need for a comfortable and safe trip, including climate control, seatbelts, reclining seats, DVD and CD players and CCTV, you can rest assured that when you arrange coach hire in Crawleywith us you’ll be travelling with the best. 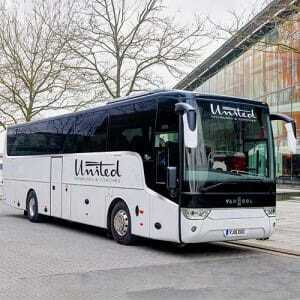 We have coaches available to accommodate up to 57 people, and every one of them will travel in comfort and style. Do You Need Minibus Hire in Crawley? Perhaps you’re arranging a night out with your friends and nobody wants to be the designated driver? Perhaps you’re visiting a local attraction as a small group or heading to the airport with all the family for a well-deserved holiday? Our minibus hire in Crawley with driverservice is ideal for you. 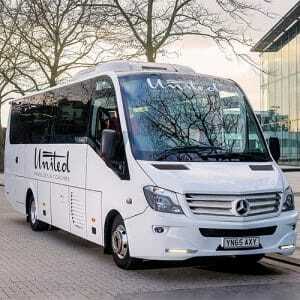 Compared to other firms offering minibus hire in Crawley, you can depend on us to get you where you’re going in luxury. Our modern minibuses feature leather seats with arm rests and reading lights as well as seatbelts and CCTV for your safety and protection. Our vehicles are also equipped with a CD and DVD player as well as a flat screen monitor for your entertainment, USB connectivity to keep you connected and climate control for your comfort. We even have a refrigerator to keep your drinks cold. If you’re looking for a minibus hire company based in Crawley, United Minibuses and Coaches are delighted to be your number one choice. Whether you’re visiting the West Sussex area or whether you live locally, if you need coaches servicesto get to your destination, we’re on hand to help you out. There are countless places to visit within the local area, and all are within easy reach by minibus or coach. If you’re looking for inspiration when exploring Crawley, here are some of the most popular destinations that we serve. Gatwick Airport– if you’re heading off on holiday, we can make sure you’re on time for your flight. Biggin Hill Memorial Museum– discover vintage Spitfires and relive the golden age of flight at the Heritage Hanger. County Mall– enjoy some retail therapy at Crawley’s County Mall, home to all the biggest brands. K2– go for a swim, a workout or attend a class at this impressive leisure centre. Tilgate Park– enjoy a relaxing stroll or let the kids blow off steam at this fun-filled family park. Go Ape– conveniently located in Tilgate Park, this high ropes course lets you unleash your inner explorer. Hawth Theatre– see a show and enjoy live performances at this venue. Cineworld– take in one of the latest blockbusters at Crawley’s cinema. Brighton– just a short drive from Crawley, you can visit the coast at this famous seaside resort. Ifield Golf Club– tee off and hit a birdie! Lingfield Park– place a wager on the races. Cottesmore Country Club– enjoy the golf course and stylish wedding venue. Ifield Water Mill– discover the only working watermill in West Sussex. Crawley College– discover a range of full-time and part-time courses at this premier educational establishment. Crawley Festival– hear local talent perform live and this fantastic community event. Langshott Manor– a beautiful and popular local wedding venue and historic hotel. Balcombe Place– boasting stunning views, this hotel is a popular wedding venue. University of Sussex– located close to Crawley, this higher educational institution offers a range of courses. Worth School– one of the UK’s top independent schools in the heart of West Sussex. 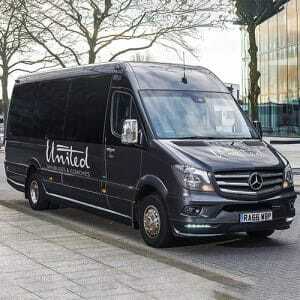 Discover all these and many more with United Minibuses and Coaches’ luxurious vehicles. We’re your premier choice for minibus and coach hire in Crawley, so call us now to find out more about our exemplary service.